Interstate 40 crosses Leroux Wash ahead of the eastbound split with U.S. 180 at Business Loop I-40 and the city of Holbrook. Photo taken 07/13/08. Interstate 40 has numerous signed business routes, including the Winston-Salem business loop freeway. Several routes in Arizona and New Mexico were turned over to local control or redesignated as other state routes. Listed in the 1991 California State Signing Log, this business route follows Old U.S. 66-95 (National Trails Highway) along a 3.4 mile course between Exits 141 and 144. Business Loop I-40 intertwines with I-40 along River Road south, Needles Highway east and Broadway Street south. The loop also provides a connection from I-40 to the north section of Arizona 95 en route to Bullhead City. That stretch of AZ 95 is not connected with the southern portion of the route to Lake Havasu City. This business route used to follow Historic U.S. 66 between Exits 48 and 53 via Beale Street and Andy Devine Drive through Kingman. 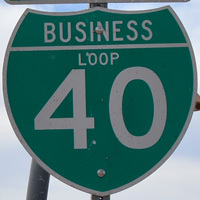 Business Loop I-40 was decommissioned on May 30, 2003 with approval by AASHTO in order to transfer maintenance of the highway from the state to the city of Kingman. The route is now signed solely with Historic U.S. 66 shields. 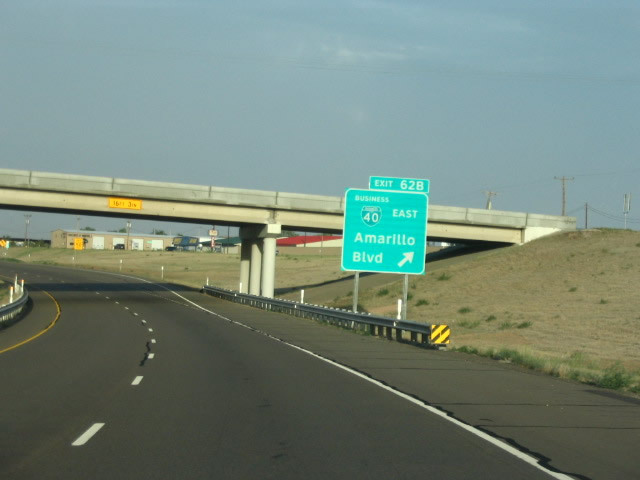 Business Loop I-40 connects Interstate 40 with the community of Seligman north from Exits 121 and 123. The 4.25 mile route overlaps with Historic U.S. 66 east from near Seligman Airport (P23) to a point east of Lamport Street. Business Loop I-40 serves the rural community of Ash Fork along a 1.49 mile route following Historic U.S. 66 and old U.S. 89. Lewis Avenue leads the loop east from Exit 144 to split with Park Avenue as a one-way couplet. 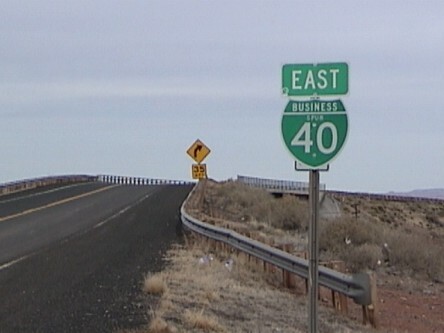 The business route returns to I-40 at Exit 40 opposite the north end of Arizona 89 (old U.S. 89 south to Prescott). Interstate 40 bypassed the final segment of Historic U.S. 66 when it opened on October 13, 1984 at Williams. The designation was retired the following year on June 27,1 with the former alignment between Exits 161 and 165 renumbered as Business Loop I-40. This loop is locally maintained. The second longest of the business routes in Arizona at 9.51 miles, the Flagstaff loop runs east from Exit 191 along Historic U.S. 66 and old U.S. 89 to Arizona 89A (Milton Road). Milton Road leads the loop north to Old Santa Fe Avenue east and Downtown. U.S. 180 combines with Business Loop I-40 east from Humphreys Street to Country Club Drive and the southern terminus of U.S. 89. Business Loop I-40 & U.S. 180 (Country Club Drive) spans Historic U.S. 66, a BNSF Railroad and Industrial Drive south to Interstate 40 at Exit 201.
Business Loop I-40 was decommissioned in 2007. It followed old U.S. 66 along 3rd Street east from Exit 252 alongsize Arizona 99 to a couplet with 2nd Street through Downtown Winslow. Arizona 87 joined the route east from Williamson Avenue to Transcon Lane, where Business Loop I-40 turned north to I-40 at Exit 255.
Business Spur I-40 extends west from the former Business Loop I-40 (Hipkoe Drive) by Exit 252. The 1.01 mile spur follows 3rd Street and Winslow Industrial Spur to end north of Coopertown Road. Two shields are posted for the route south of the 1975-built BNSF Railroad bridge. 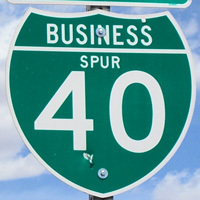 Business Spur I-40 was 1.44 miles in length per the ADOT 1998 State Highway System Log. It previously ended at the Coconino County line. Business Loop I-40 in Joseph City joins Historic U.S. 66 along Main Street north from diamond interchanges at Exits 274 and 277. The route travels 2.83 miles. 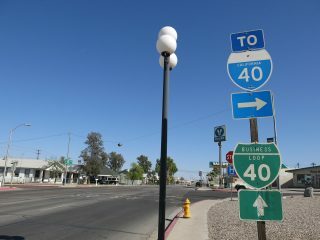 Interstate 40 bisects the city of Holbrook between the downtown area and northern reaches of the city. 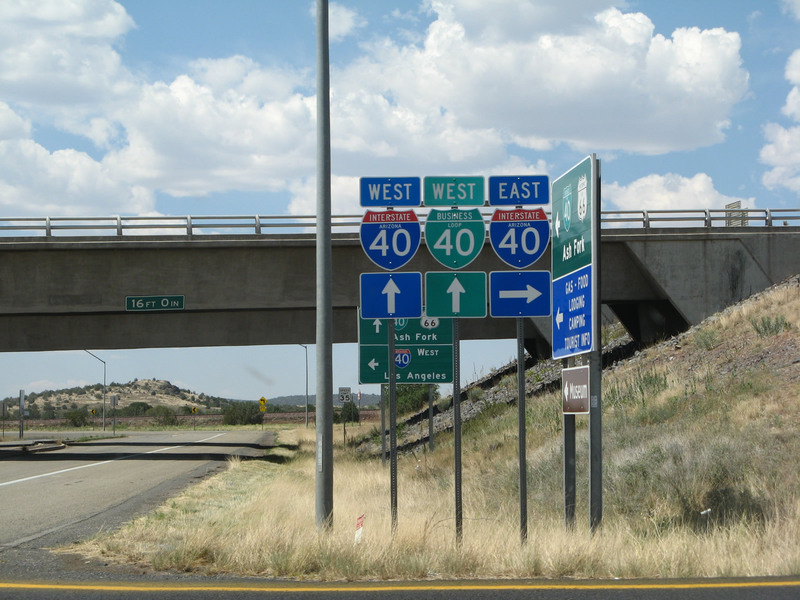 Three interchanges serve the Navajo County seat, all with Business Loop I-40. The western portion of the route overlaps with U.S. 180 along Hopi Street (old U.S. 66) east to Arizona 77 in Downtown. U.S. 180 combines with Arizona 77 south briefly before parting ways to Petrified Forest National Park and Snowflake respectively. 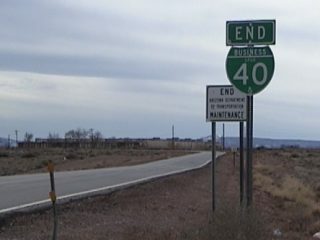 Arizona 77 joins the business route along Navajo Boulevard north to its end at Exit 286, where the 5.09 mile state highway portion of Business Loop I-40 ends. 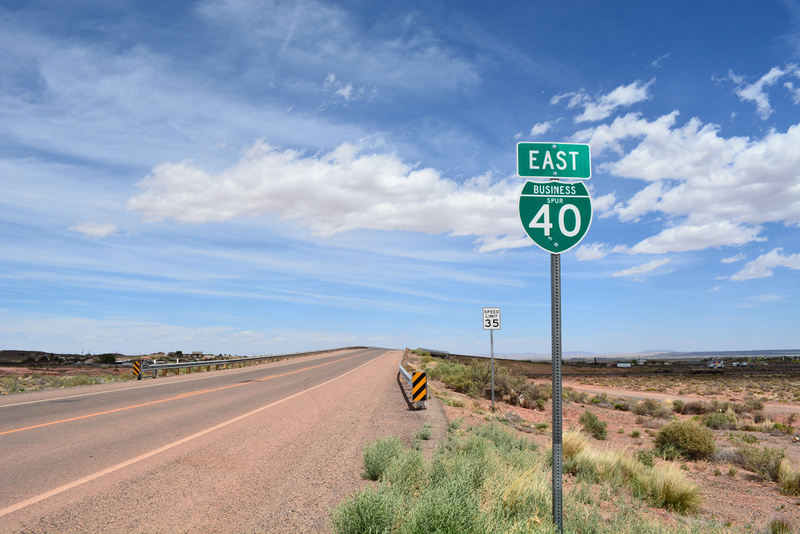 The remainder of Business Loop I-40 (Navajo Boulevard) northeast to Holbrook Municipal Airport and Exit 289 is locally maintained. 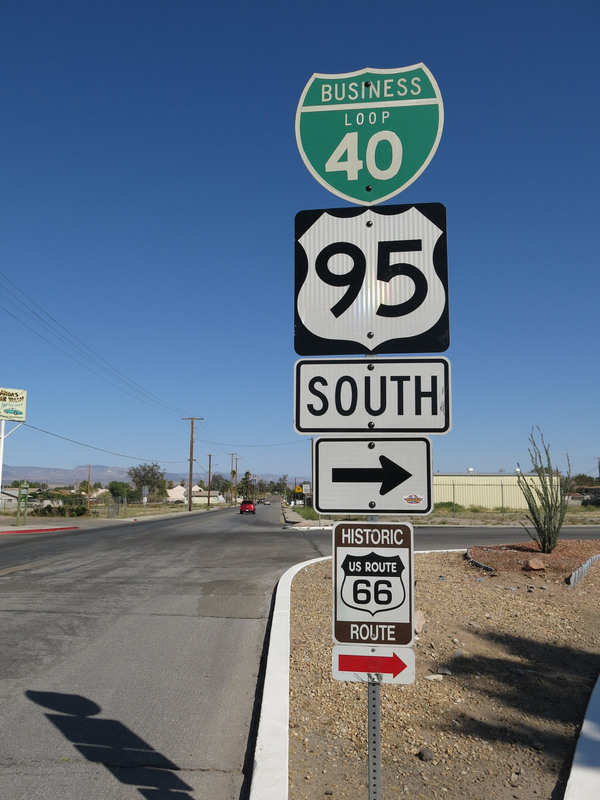 This business route followed Historic U.S. 66 for 9.5 miles between Exits 16 and 26. 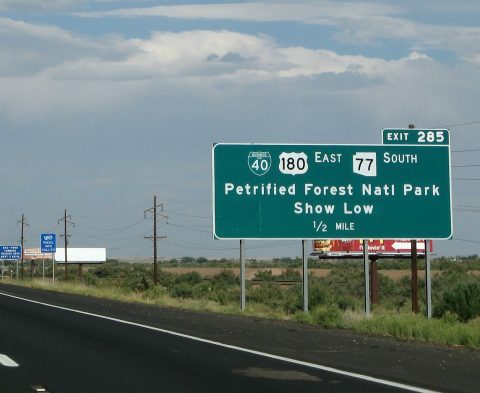 The route is still acknowledged on freeway guide signs and on a few shields in Gallup as of 2016, but is inventoried otherwise as the easternmost stretch of New Mexico 118. NM 118 travels 36.85 miles along old U.S. 66 from the Arizona state line to end at Exit 36. Gallup is the southern terminus of U.S. 491 (formerly designated as U.S. 666 until AASHTO approved its renumbering on May 30, 2003). Business Loop I-40 across the city was inventoried by NMDOT as BL-31-P.
Inventoried by NMDOT as BL-32-P, the former business loop through Grants traveled along old U.S. 66 (Santa Fe Avenue) from Horizon Avenue (Exit 79) east to the curve of Santa Fe Avenue south to Exit 86. It was replaced by NM 615 on Horizon Avenue and NM 122 east to its end. 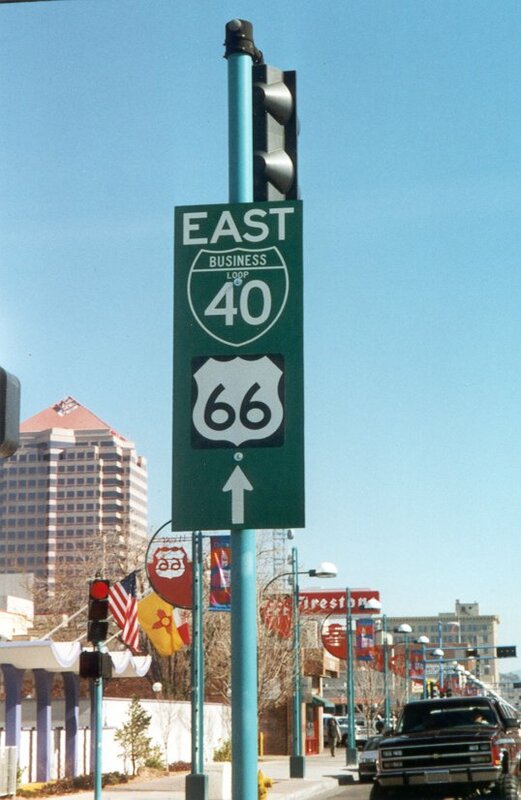 Guide signs on I-40 still acknowledged the business loop in 2016.
Business Loop I-40 ran in tandem with U.S. 66 across the city of Albuquerque. The designation outlasted U.S. 66, which was retired in 1985, by a period of time before it was also eliminated. 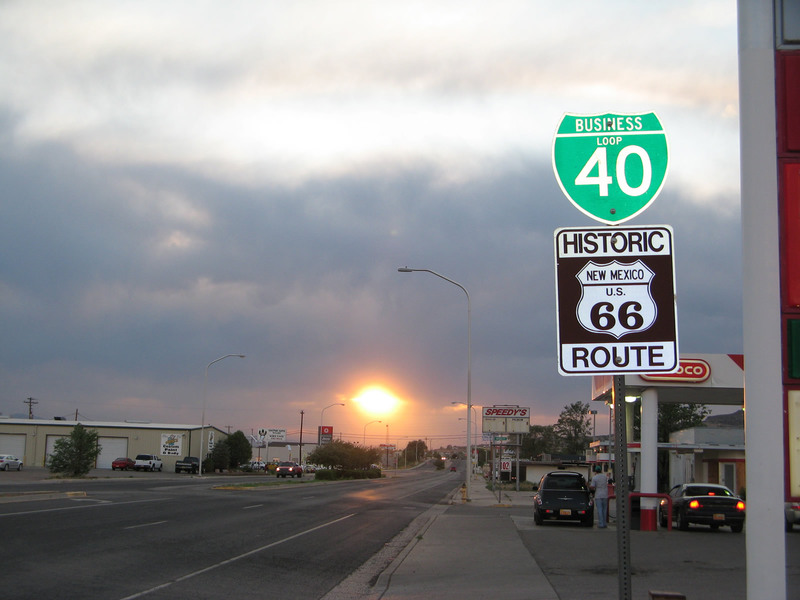 The 18 mile route joined Central Avenue (Historic U.S. 66) east from a wye interchange (Exit 149) west of Albuquerque. This exchange was removed during a 2009-11 project to add ramps with adjacent Atrisco Vista Boulevard (NM 500) nearby. Central Avenue constitutes the main arterial across central Albuquerque. It runs directly through Downtown and by the University of New Mexico as Interstate 40 stays to the north. Historic U.S. 66 and I-40 come together again at a trumpet interchange (Exit 167) by Tijeras Canyon. Several signs remained for Business Loop I-40 in and around the central business district as recently as July 2008.
Business Loop I-40 (BL-34-P) travels 2.92 miles on the south side of I-40 along Old U.S. 66 through the city of Moriarity. The business route begins at a trumpet interchange (Exit 194) with Old U.S. 66 adjacent to the east end of NM 333 (old U.S. 66 west to Albuquerque). 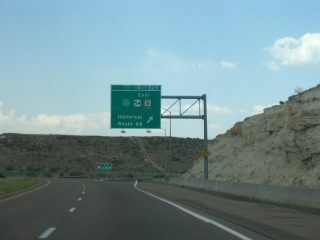 The east end is located at Exit 197 where I-40 directly replaced U.S. 66 east to Exit 203. The Santa Rosa business route follows a combination of Historic U.S. 66, U.S. 54 and U.S. 84 between Exits 273 and 277. BL-35-P totals 4.37 miles along Coronado Street, Park Avenue and Will Rogers Road. A number of traveler services line the business loop west and east of Exit 275, where it shifts sides with I-40. Business Loop I-40 joins Tucumcari Boulevard east from Exit 325 to Downtown and a return to I-40 at Exit 335. U.S. 54 accompanies the route from I-40 east to Railroad Avenue as well. Inventoried by NMDOT as BL-36P, the Tucumcari business route is 7.65 miles long. 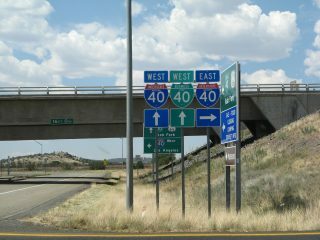 Business Spur I-40A connects Interstate 40 with Historic U.S. 66 leading west back into New Mexico from Exit 0. The 0.779 mile segment was designated on June 21, 1990 as a mileage transfer from State Loop 504. Historic U.S. 66 travels west to the former settlement of Glenrio at the state line. A short distance west from there is impassable segment of U.S. 66 that turned northward across Trujillo Creek. U.S. 66 originally curved northward across the current path of I-40 west toward Exit 369 (NM 93 south / NM 392 north). Adrian is a rural city with a population of around 150. Business Loop I-40B was established on June 21, 1990 in place of State Loop 550 to serve the town from Interstate 40. The 2.37 mile business route runs along a portion of Historic U.S. 66 between ramps at Exits 22 and 23. Originally a split diamond interchange joined the freeway with Adrian. Three additional ramps were added later. Interstate 40 diverges from Historic U.S. 66 to arc south of Vega between Exits 34 and 37. Lining the former U.S. 66 (Vega Boulevard) through the Oldam County seat is Business Loop I-40C. It totals 3.40 miles and replaced State Loop 551 on June 21, 1990.
Business Loop I-40D branches northeasterly from Interstate 40 at Exit 62B along a divided highway to U.S. 60, 87 and 287 in north Amarillo. U.S. 60 combines with the business route for 11 miles east from there to Folsom and a rural split near the Carson County line. Beyond their separation, U.S. 60 stays north to Panhandle while Business Loop I-40 bee lines southeast to trumpet interchange (Exit 85) with I-40. All 24.4 miles of Business Loop I-40 follows Historic U.S. 66. The highway was created on October 25, 1990 in place of State Loop 552. 14.13 miles are attributed to the business loop while the rest are inventoried with U.S. 60. A change made at the U.S. 60 and Business Loop I-40 east split removed the high speed wye configuration and replaced it with a 90 degree angle intersection. Interstate 40 circles around the north side of Groom while Business Loop I-40F follows Historic U.S. 66 (Front Street) through the town. The 3.53 mile route was established in place of State Loop 554 on June 21, 1990 between Exits 110 and 114.
Business Loop I-40H arcs northward from Interstate 40 for 3.80 miles between Exits 141 and 143. Replacing State Loop 555 along Historic U.S. 66, the business route was established on June 21, 1990.
Business Loop I-40J travels due east along Historic U.S. 66 (12th Street) from Interstate 40 at Exit 161 to Exit 164. The 2.77 mile alignment was transferred from the mileage of State Loop 556 on March 24, 1993.
Business Loop I-40 heads south from Exit 5 along West 1720 to join a four-lane divided section of Historic U.S. 66 east to the city of Erick. The route narrows through the city center on Roger Miller Boulevard and expands again into a divided highway east and north. The 8.1 mile route ends at a folded diamond interchange (Exit 11), as Historic U.S. 66 shifts north of I-40 en route to Sayre. Interstate 40 travels northerly across the North Red River by the city of Sayre between Exits 20 and 25. Business Loop I-40 combines with U.S. 283 as part of a 4.9 mile route west through the Beckham County seat. The two routes follow Historic U.S. 66 (Fourth Street) through the city center. 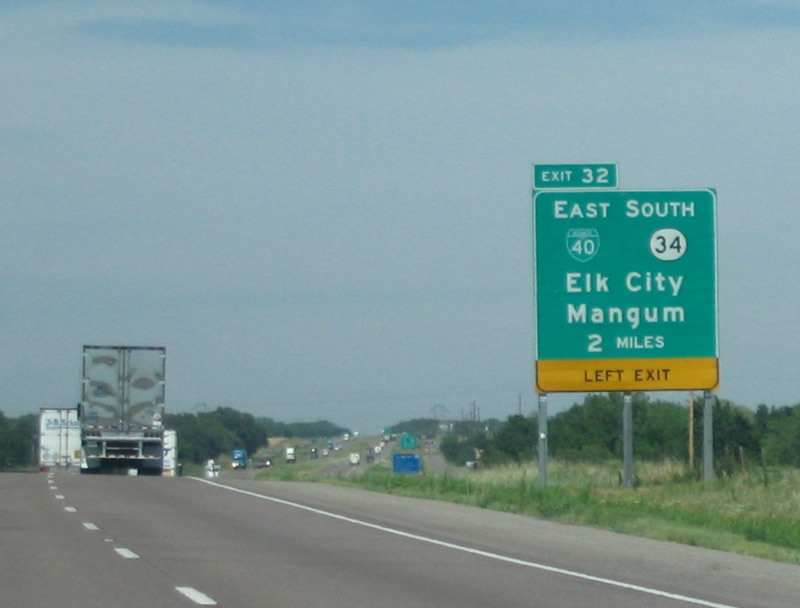 Interstate 40 turns back to the east from the Sayre area to next reach Elk City. 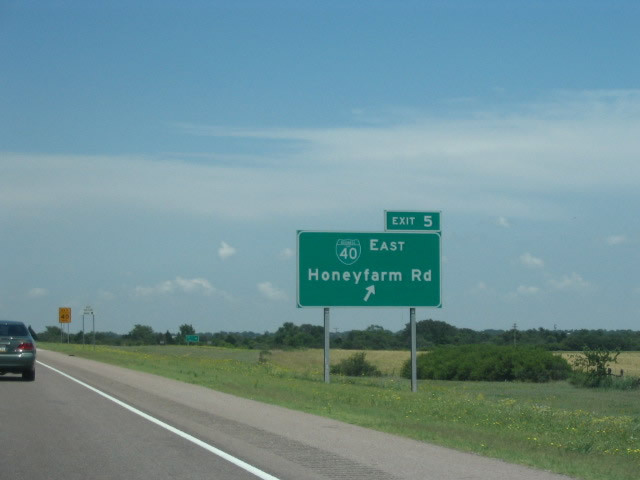 The freeway and Historic U.S. 66 separate at a wye interchange (Exit 32) well west of the city. Business Loop I-40 commences a 9.5 mile route from there along a four-lane divided highway east to Oklahoma 6. SH 6 joins the business route east as Historic U.S. 66 transitions into a commercial arterial (3rd Street) through west Elk City. Business Loop I-40, Historic U.S. 66 & SH 6 enter Downtown Elk City and split at Main Street. SH 6 leads south to I-40 at Exit 38 while the business route turns north on Van Buren Avenue. One final turn takes Business Loop I-40 east at Country Club Boulevard and Elk City Regional Business Airport (ELK) for a divided highway leading back to Interstate 40. The freeway overtakes the old alignment of U.S. 66 east from the wye interchange (Exit 41) to Canute. Business Loop I-40 arcs north from Exit 65 along Gary Boulevard (Historic U.S. 66) to the Clinton city center. The business route concludes a 5.6 mile alignment east of Turtle Creek at a wye interchange (Exit 69). The Weatherford business route branches north from a wye interchange (Exit 80A) to join Main Street (Historic U.S. 66) east through the city center. Main Street proceeds east from there to a trumpet interchange (Exit 82). Business Loop I-40 travels 2.3 miles overall. The 8.6 mile loop of Business I-40 through El Reno splits with I-40 at Exit 119 to overtake old U.S. 66 & 270 east to Sunset Drive. U.S. 81 merges with the business route from Choctaw Avenue, as the loop turns south one block to Wade Street and east two blocks to Rock Island Avenue. Business Loop I-40 & U.S. 81 (Rock Island Avenue) leave the El Reno street grid at Elm Avenue and curve southeast to SE 27th Street and Shepherd Avenue. 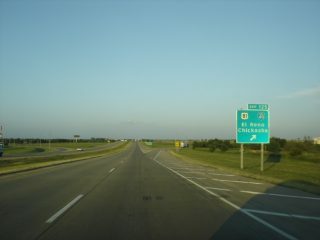 There Oklahoma 66 begins and heads east to Oklahoma City while U.S. 81 and the business route turn south to I-40 at Exit 125. Oklahoma City Boulevard is an at-grade roadway built along the corridor of the former I-40 Crosstown route south of Downtown Oklahoma City. It branches east from Exit 148B and returns to I-40 at the exchange with Interstate 235.
Business Loop I-40 overlaps with U.S. 62-75 Business east from Exit 237 to Main Street through Downtown Henryetta. The 3.5 mile long route returns to I-40 by way of U.S. 62 & 75 south at the full cloverleaf interchange (Exit 240) with the Indian Nation Turnpike. Interstate 40 bypasses the city of Sallisaw to the south, while Business Loop I-40 arcs 4.0 miles north from Exits 308 and 311. The west leg runs along side U.S. 59 north to U.S. 64. The three routes overlap east along Cherokee Avenue to Downtown and Wheeler Street, where U.S. 59 turns north to Stillwell. U.S. 64 continues with Business Loop I-40 southeast along a commercial arterial to Interstate 40. This Business Loop Freeway was approved by AASHTO on October 2, 1992 as part of the Interstate 40 relocation around Winston-Salem. The new alignment for I-40 (Corporation Parkway) was constructed across the south side of Winston-Salem and through rural areas of Forsyth County to move through traffic away from the aging expressway. It opened in 1993.
Business Loop I-40 travels a 23 mile route concurrent with U.S. 421 and partially along side U.S. 158 and North Carolina 150. The freeway veers north from I-40 at Exit 188 to Downtown Winston-Salem, where it crosses paths with the U.S. 52 (Future I-285) & U.S. 311 freeway. Continuing east, Business Loop I-40 & U.S. 421 wind across the town of Kernersville and end at a wye interchange (Exit 206) with I-40 just west of the Greensboro city limits. Business Loop I-40 in Greensboro was a short lived designation applied to the current alignment of Interstate 40 through Greensboro. Designated on February 21, 2008, the business loop was created in an attempt to both reroute Interstate 40 through traffic around the city and remove a substandard section of old Interstates 40 & 85, including the infamous “Death Valley” section, from the Interstate Highway System. Death Valley was the local nickname given to the narrow interchange where the two routes met in central Greensboro. Business Loop I-40 traveled 15.5 miles overall, with the eastern eight miles overlapping with Business Loop I-85. During this time, Interstate 40 bypassed Greensboro to the southwest along a newly opened freeway (Interstate 73 / Painter Boulevard) and joined I-85 to the southeast on a section of roadway opened in January 2004. Motorists confusion and funding changes for maintenance of the now former I-40 (due to it no longer being considered an Interstate) resulted in a second round of renumbering at Greensboro in September 2008. I-40 was relocated back through the city, Business Loop I-40 was eliminated, and U.S. 421 was realigned to bypass the city along side I-73. The Raleigh Belt Line, an east-west freeway between Exits 293 and 301, was first designated as Business Loop I-40 before officials opted for a full Interstate designation. The elimination of the business loop coincided with the establishment of 25.05 miles of Interstate 440. These changes were approved by AASHTO on June 9, 1991. Later changes to I-440 would extend the route to a full beltway around Raleigh. The concurrent section with I-40 however was eventually dropped. Eisenhower Interstate Highway System, Previous Facts of the Day – March 12, 2010. Oklahoma Department of Transportation – I-40Crosstown, project web site. “Update on downtown OKC boulevard project.” OKC Talk, October 27, 2016. “Re: I40 Crosstown Nearly Ready to Open” online posting by okroads, AARoads Forum, January 5, 2012. “Business 40 renamed Salem Parkway.” Winston-Salem Journal, October 21, 2016. Page updated November 5, 2016.
Business Loop I-40 follows Historic U.S. 66 (San Bernardino County 66) through Needles, California. The street makes several turns along its path including this one from Needles Highway to Broadway Street. Photo taken 03/24/13. Broadway Street east at J Street in Needles. Business Loop I-40 continues south to I-40 at Exit 144, while J Street connects with the adjacent freeway at Exit 142. Photo taken 03/24/13. Business Loop I-40 guide sign formerly posted on Andy Devine Avenue in Kingman, Arizona. 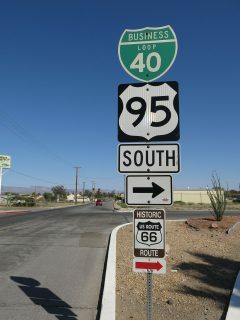 This route was decommissioned in May 2003 and replaced with signs for Historic U.S. 66. Photo taken 10/24/03. Arizona 89 north transitions directly into Business Loop I-40 & Historic U.S. 66 at the east Ash Fork interchange (Exit 146). Photo taken 10/24/03. Interstate 40 east at the Williams business route (Exit 161). This loop is not inventoried in the ADOT Route Log. Photo taken 06/28/08. The lone shield for Business Spur I-40 east at Winslow, Arizona precedes the BNSF Railroad bridge on Winslow Industrial Spur east. This assembly was still posted as of 2017. Photo taken by Jim Mullady (02/01). An end shield for Business Spur I-40 west appears at an unnamed road south of the BNSF Railroad bridge. It was still in place as of 2017. Photo taken by Jim Mullady (02/01). 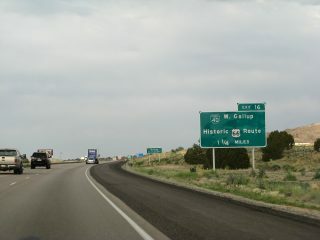 Approaching the west end of the Gallup business loop (Exit 16) on Interstate 40 east. This route was replaced by New Mexico 118. Photo taken 06/28/08. 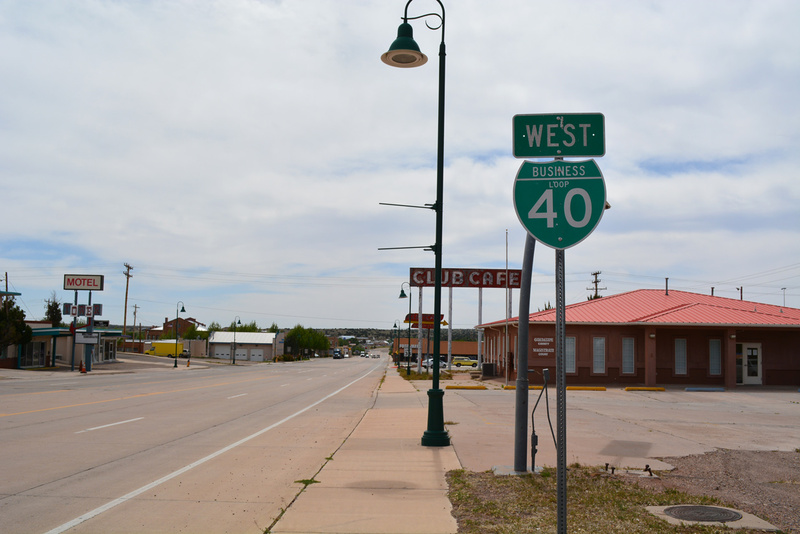 A stormy day neared its end at Grants, New Mexico, where a set of reassurance markers for Business Loop I-40 & Historic U.S. 66 west stood at Santa Fe Avenue and Bradley Street. Photo taken 06/28/08. 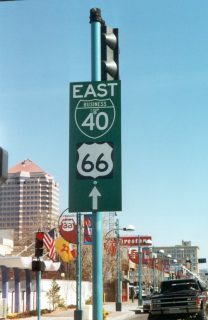 A remaining sign showing Business Loop I-40 on Central Avenue in Albuquerque, New Mexico. Photo taken by Casey Cooper (1998). 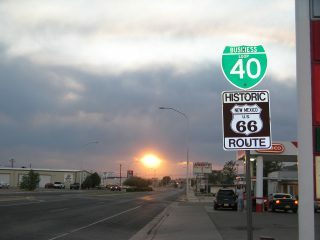 Business Loop I-40, U.S. 54 & Historic U.S. 66 diverge from eastbound Interstate 40 near Tucumcari at Exit 329. Notably, this was the first of two meetings between U.S. 54 and 66, with the second located in Downtown Chicago before the 1972 retraction of U.S. 54 out of the Windy City. Photo taken by Robert Lee (06/17/06). 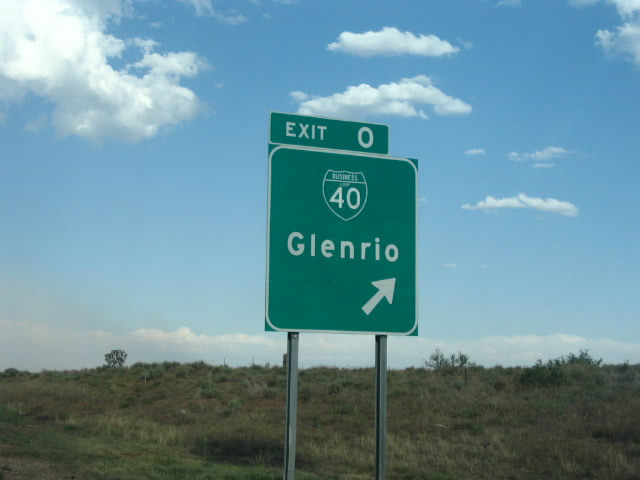 Business Spur I-40 departed from Interstate 40 east for the ghost town of Glenrio. Exit 0 was signed here as loop instead of a spur. A sign replacement made a year later retained the error. Photo taken by Robert Lee (06/17/06). 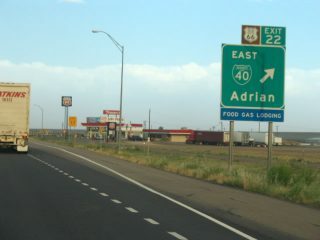 Interstate 40 east at the first of two exits with Business Loop I-40 at Adrian, Texas. Photo taken by Robert Lee (06/17/06). 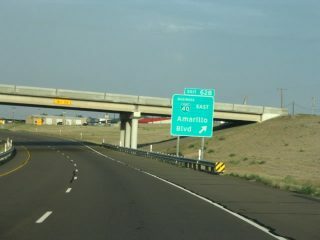 Business Loop I-40 separates from I-40 east at a wye interchange (Exit 62B) on the outskirts of Amarillo, Texas. Photo taken by Robert Lee (06/17/06). Honeyfarm Road connects I-40 with old U.S. 66 as part of the Erick, Oklahoma business loop. Photo taken by Robert Lee (06/18/06). Interstate 40 turned east to pass south of Elk City as Business Loop I-40 branched northeast along old U.S. 66 from Exit 32. Photo taken by Robert Lee (06/18/06). Interstate 40 eastbound approaches the east end of the El Reno, Oklahoma business loop. Photo taken by Eric Stuve (07/04/08). This photo is part of Eric Stuve’s photostream on Flickr. Business Loop I-40-U.S. 62B west & U.S. 75B south combine along Main Street west through Henryetta, Oklahoma. Photo taken 05/06/12.